Alpha Solar Group is a woman and veteran owned solar development company based in northern Virginia. Their mission is to create quality solar projects and to educate, train, and employ the next generation of solar installers and leaders. Alpha Solar Group is a woman and veteran owned solar development company that has been active in the D.C. area for years, but their website was very out of date and not functional for their current needs. Alpha Solar Group approached DCDS with a need for a simple website that would showcase their services and brand image to prospective customers. 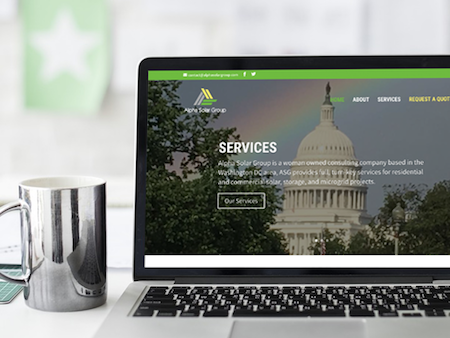 DCDS worked with some of Alpha Solar Group’s existing designs, such as a logo and brand colors, can used newer web design practices to update their website for a modern audience. As stated before, when Alpha Solar Group came to DCDS, they already had a logo and brand colors that they were very happy with. 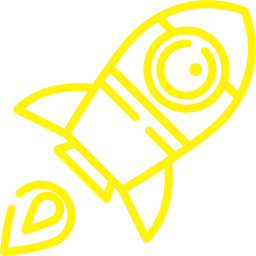 They also had a strong mission statement and a list of their core values that they wanted implemented into their website. 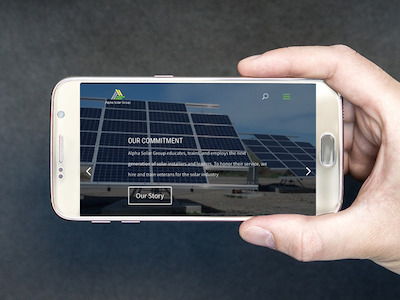 DCDS created a starting content strategy and a copy for the website, as well as provided web design, development, and hosting services to Alpha Solar Group. This helped them by bringing their website as up to date as their solar products and service are. For this project, DCDS focused on making Alpha Solar Group’s website clean and simple, as as not to take away from the information and service description content that were crucial to the website. But even though functionality and efficiency were top priority, we didn’t sacrifice the design that all modern websites need to have. 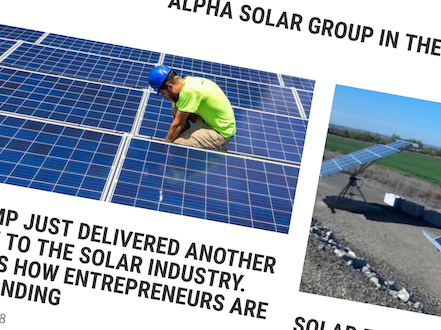 We are excited to see where this new website will take Alpha Solar Group. You can checkout their website here.